High Line | Photo Credit: ©Find. Eat. Drink. The High Line is a public park built along what had been an abandoned elevated train trestle. The first train ran on the tracks in 1934 and the last train in 1980. For decades, the railway sat dormant while groups lobbied to demolish it. In the late 90s, advocates stepped in to save the decaying tracks and proposed transforming it into a park in the sky. In 2002, Friends of the High Line won a lawsuit challenging the city's plans to raze what remained of the tracks. Today, the urban park extends from Gansevoort and Washington Street in the Meat Packing District to 34th Street, between 10th and 12th Avenues. The 1.45-mile-long park receives well about 7.6 million visitors each year and has had a dramatic impact along the neighborhoods it touches. Here is a guide to help you with sustenance when you visit the park. Whether you're there for an early morning run or a late night stroll, here are places chefs love to eat and drink within walking distance of the High Line. Blue Bottle Iced Coffee on the High Line | Photo Credit: ©Find. Eat. Drink. From the New Orleans style iced coffee, to the Strada, Gibraltars, filter cones, and cold-brews, two Blue Bottle locations have your coffee needs covered. Visit the permanent location on 15th Street with a wider array of choices or, in the warmer months, their kiosk on the High Line near 16th Street. "For coffee, you can rely on Blue Bottle." "They have several stores and all live up to their name." Located southeast of the Meat Packing entrance to the High Line (Gansevoort and Washington Street), this is a great place to start your day with fresh-baked breads and muffins, breakfast sandwiches, and Rival Brothers coffee from Philadelphia. "Have the Pastrami & Hash breakfast sandwich and make sure to grab a coffee too." "Their bread program is fantastic." 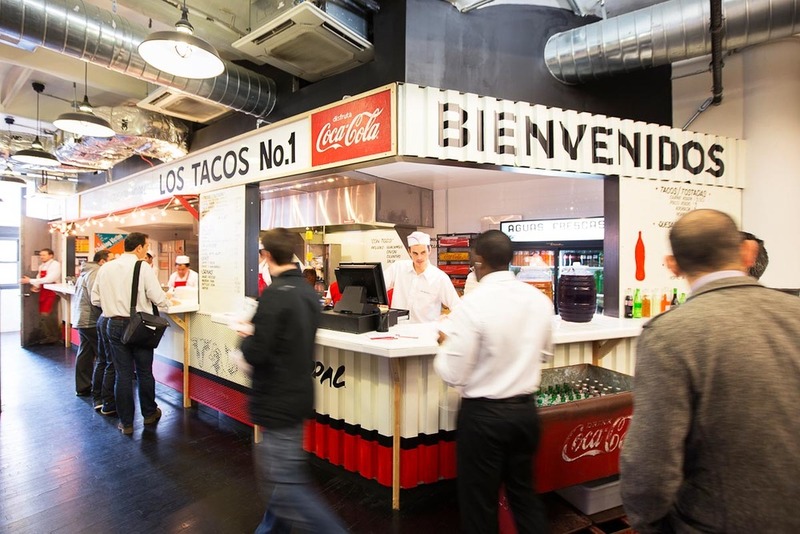 This is a standing-only taco stand opened by three friends from Tijuana, Mexico and California. Note: they also sell breakfast tacos from a cart in the Chelsea Market, located near the water fall and Ninth Street Espresso. "I love to order the Adobada (marinated pork) or the Quesadilla de Asada." Num Pang means bread or a sandwich in Cambodian. The sandwiches are made fresh daily on a toasted semolina flour baguette with their signature chili mayo. Owned by two chefs who met in college: Ratha Chaupoly worked at Blue Water Grill and Ben Daitz at Tabla before opening their take-out sandwich shops. "I love the pork belly sandwich; it's really good. It's everything you want in a sandwich: the balance of acid, heat, fatty, salty. It's perfect. I like my food to have a lot flavor and I find that sandwich just has a lot of flavor." Chef Esther Choi at Mokbar | Photo Credit: ©Find. Eat. Drink. Chef Esther Choi is making Korean versions of ramen. She recommends ordering the kimchi ramen and hocakes. They have bar seats where you can watch them preparing the dishes. Melt Bakery Guinness Ice Cream Sandwich | Photo Credit: ©Find. Eat. Drink. The Melt ice cream sandwich cart can be found seasonally on the High Line between 15th and 16th streets. Julian Plyter left his job as a pastry chef working in upscale restaurants to start making artisanal ice cream sandwiches. You'll find unique flavor combinations like Malted Chocolate Rum ice cream with Crackly Chocolate cookie. 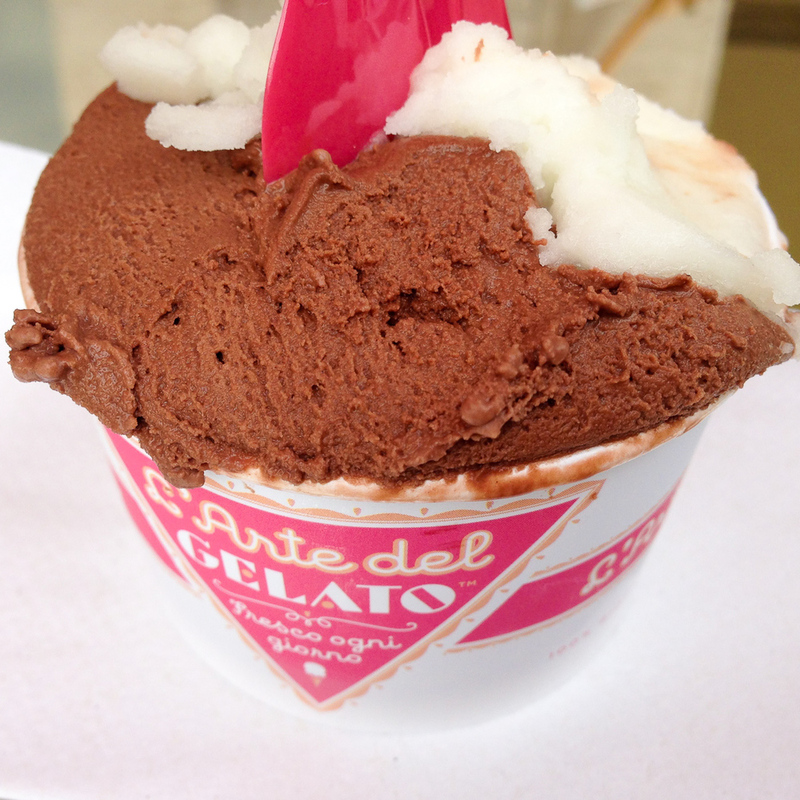 L'arte del Gelato | Photo Credit: ©Find. Eat. Drink. You can find them on the west end of Chelsea Market or seasonally as part of the High Line Food. The sell small batch artisanal gelato and sorbets made with locally-sourced organic milk, local fruit and berries, and imported ingredients from Italy. "Their hazelnut gelato knocks my socks off. " Sommelier Paul Grieco became known for his unorthodox approach to wine bars with his first location in the East Village and second one in Tribeca. This High Line outpost, recommended by sommelier Joe Campanale (Anfora, dell'anima, L'Artusi, L'Apicio), is a full-service outdoor café overlooking the Hudson River. The setting is perfect for watching the sunset with a glass of rosé. Tia Pol | Photo Credit: ©Find. Eat. Drink. Located near the 23rd Street entrance to the High Line, this tapas bar features food and drink from the different regions of Spain from Galicia to Andalucía, the Basque Country to Cataluña. Have a glass of sherry and some nibbles before you head out to dinner. "They are always pouring sherry by the glass. Fino is great paired with little fried sardines or beautiful jamon, not Rioja. Even jamon producers themselves have switched over. It's just crazy, but that's sherry." "One of my favorite spots for drinking sherry. Serving good food in a great environment." Located adjacent to the Whitney Museum at the Gansevoort and Washington entrance, you'll find artful food from chef Mike Anthony and Danny Meyer's Union Square Hospitality Group. Sit outside during the warm months or inside, which has large glass windows so you'll still feel like you're outside. Barbuto | Photo Credit: ©Find. Eat. Drink. Just a few blocks south of the Meat Packing entrance, you'll find chef Jonathan Waxman Italian restaurant located in the corner of an old garage, built to sell Rolls Royce automobiles in 1939. The three garage-style doors roll up anytime the weather allows. "I love going to Barbuto for Jonathan Waxman's food and especially for the gnocchi." "I love the chicken here, the pollo al forno. It’s probably one of the coolest spaces in New York. It's a garage that opens up and you can sit outside." "It feels a little bit like old school West Village / Tribeca cool. It's very simple. Chef Jonathan Waxman is a genius and he does the perfect sort of ‘I do simplicity’ really well, which is a tremendously underrated quality at a lot of places." Chefs and owners Ken Oringer and Jamie Bissonnette recreate their popular Boston tapas bar in Chelsea. Located in the former Nabisco Factory, you enter on the corner of 11th Avenue and 15th Street. The menu features many small plate sharing dishes and lots of Spanish Gin & Tonics. "Everything here is really good. The tripe with beans and a smoky sort of tomato sauce with blood sausage is ridiculously good. The paella is also really good and the drinks are awesome. It's really fun." This casual American bistro from restaurateur and chef Jimmy Bradley located near the 23rd Street entrance is one of the originals in the neighborhood, long before the High Line went from idea to reality. You'll find hearty and seasonal food in an unpretentious atmosphere. "Jimmy Bradley, my dear buddy and ex-chef, is a wizard, and his very comfortable eatery and eclectic menu are very easy on the palate." A European-style bistro with a backyard garden hidden away from the street. "It's neighborhoody spot with a great vibe and it's delicious for dinner and brunch. I love their menu selection and they always have great service. You sit in the backyard and see one of the chefs putting a ham in a smoker and thinking, man I want to have that." "The food has elegance and finesse that I haven't yet tasted in North America." Porchlight | Photo Credit: ©Find. Eat. Drink. A New York cocktail bar with a Southern accent from the team from Union Square Hospitality Group. The cocktail program is headed up by former Booker & Dax barman Nick Bennett. Chef Jean-Paul Bourgeois of Blue Smoke created the food menu. El Quinto Pino | Photo Credit: ©Find. Eat. Drink. Northeast of the 23rd Street Entrance, chef and owner Alex Raij draws from the tapas bars of Spain and creates an authentic and intimate experience. The menu features small plate dishes, cocktails, Spanish wines and sherry. "Even though chef Raij hates it when I say this, the Uni Toast is ridiculously delicious and a must eat. Also, munch on those fried chickpeas with some ham and a glass of sherry."